My Dali shrine that I set up for my show October 30, 2015. The flowers are from my yard. Would you believe it? One of the names for it is Marigold Tree! Well, I’m happy to report that my show at The Red Sable through October 2015 was a great success! I sold two paintings (one even before the show opened! Thank you, Laurel!) and lots of prints and cards. I had more people sign up for my newsletter, Bone Appetit. 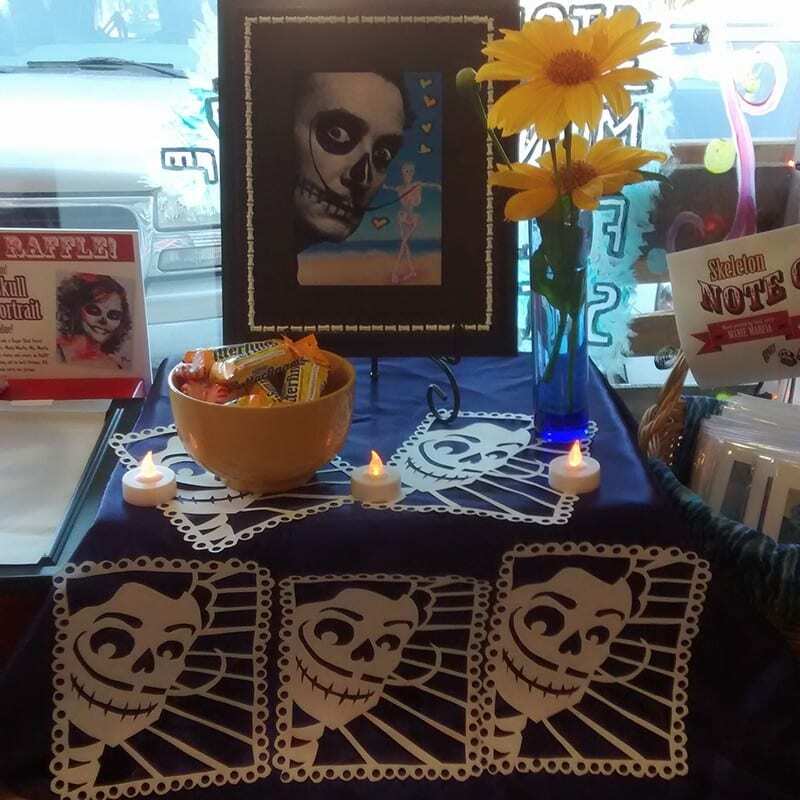 The Artist Reception/Day of the Dead festival on October 30 was wonderful, too. There weren’t a ton of people that night but the ones that showed were over the moon about a Day of the Dead Festival in St. Augustine, and so I think that next year’s will be bigger and better than ever. I don’t think I emphasized the fund raising part of the evening enough, but in fact, between booth fees and sales, we made a substantial contribution to a family’s fundraising efforts on behalf of their two kids who have leukemia, and I’m really proud of that. Melissa, owner of The Red Sable, said I did the most sales of any other artist she’s featured at the store and she’d like me back next October, so hurray! Since Steve and I are planning to be back in Michigan by then, this will call for a long camping trip to Florida in October, but hey, I’m up for it! I’ve already started thinking of new skellies to have ready for next year and next year’s Day of the Dead Festival in St. Augustine is in my iCal. I hope to see you there, too. 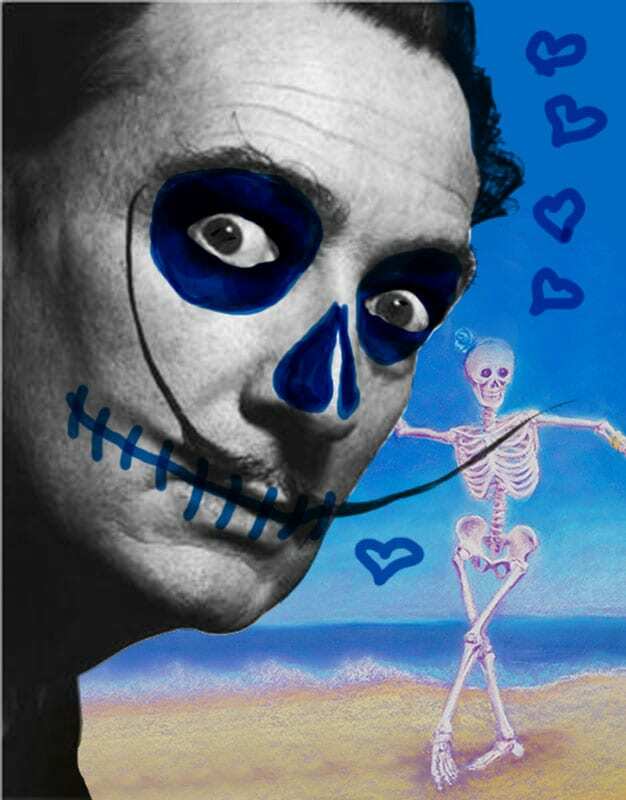 This entry was posted in art business, skeletons and tagged Day of the Dead, festival, show, skelly show, wrap-up on November 6, 2015 by Marie Marfia.